I have had this card for a short time and have had none of the problems others have had. I recieved my sign up bonus within the first month and I didn’t have to ask for it, it was just there a couple of days after meeting the required spend. I know Wells has had their share of problems lately but this card isn’t one of them at least in my experience. I will say the only reason I didn’t give 5 stars is the app seems rather antiquated, it’s more like a reformatted web page but it does get the job done. I had to fight them for my $200 reward. Make sure you get written proof that you will get what you signed up for. A lot of fake negative reviews on here. I have never had the slightest problem with this card. Rewards were given on schedule and if you use online access, you can control everything including points. Either the people writing these reviews are financial morons or they are liars with some sort of grudge against WF. You mean not a single person is employed at Wells in customer service? This is just completely untrue. There is an app and a customer service number which you can easily Google. Where did they pull credit from? So in 2019, Wells Fargo still hasn't launched a website for online services? And they need to start a customer service department real soon? 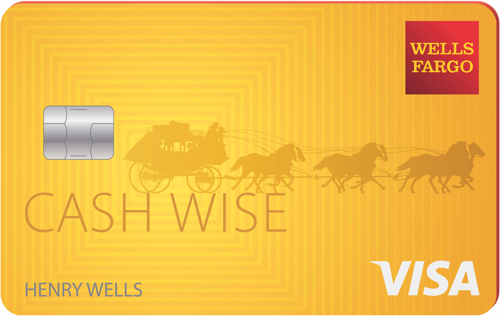 My Wells Fargo Cash Wise Visa has been the best credit card I have ever owned. The latest chip has made it even more safe and reliable. The WF customer service staff have always been friendly and professional. Keep up the good work, Wells Fargo. Are you a WF employee? You sound like one. Why did you apply for and become a customer then? They have always treated me with the utmost respect. I have never had any issues with Wells Fargo. The reviews are about the card, not the bank. So you are saying you don't have a brain either because you did business with them? Horrible service, hope credit Karma wakes up and stops promoting. Don't attach yourself to this carp company. You work for that slimmy Wells Fargo and someone from Wells Fargo Bamboozled you and paid you . 15 cents to udderly tell people you love them yeah right you didn't watch you accounts or the news they stole plenty from me🤑 money and greed it will get forever with those wellssss fffaaarrggoo ripoffs my experience and true opinions thanks for you respect! I have my visas with us bank. They are a much better bank. Ok so I saw this card and the bonus available. I thought ok lets give Wells Fargo another chance since they have to be cleaning there problems up and trying to do right for there customers. The application and approval was quick and easy. Got my card pretty quick too. I spend a lot of money monthly on credit cards so I hit the threshold of the reward before the end of my first month of use. I hate to admit this but I have better rewards cards so after I hit my reward I switched back to my regular card. Good thing too because Wells Fargo once again proved why you should never trust this bank with any of your information. Years ago I was added to a relatives safe deposit box just in case anything ever happend to them. Btw, Wells Fargo bothched that process up too. Lord knows what this bank did with my information. Well getting back to this card I was wondering where my check was since I hit the reward. I get a call from the person who added me to there safe deposit saying you have mail at my house??? Why is this? I have no idea and when I got ahold of this mail it was from Wells Fargo and it was my reward check. They sent my reward check to an address I had nothing to do with and never gave them as my addess. The addess where the credit card was sent and billing was coming to my proper address that I gave when I applied. So what is going on? When I called Wells Fargo and spoke with customer service they informed me sorry your account shell profile has that other persons address on file and since the "outside Vendor" who processes the rewards for Wells Fargo only gets that infomation it's why it was sent to the wrong address. This made very little sense to me and proves again Wells Fargo needs to be shut down. It's a bank that will never get it right or protect your privacy. The rep even made comments like good thing Im still in contact with that person and just imagine if it was something like a Mistress and didn't want the husband or relatives seeing my name. :( Are you kidding me? No reward is worth jepordizing your personal information and Wells Fargo has proved it will abuse your privacy and risk your information for the sole purpose of the bottom line. Avoid Wells Fargo if you value your private information. Wow this review process is looking about as pathetic as Wells Fargo. My situation even got worse, they changed the address on the persons account to mine. They told me they were just changing my address for my account and wouldn't touch theirs. So Wells Fargo took action once again on someone's account without proper authorization. My situation has been escalated to executive offices even and they are in the process of cleaning up there mistakes and mess. What I want to know is who are these people clicking my review didn't help? Are you employee's of Wells Fargo? Really what does someone has to say for you to realize this bank is a joke? I mean if you don't think my example shows a serious problem with there processes why would anyone want to read or hear what you have to say about anything? How about if anyone else doesn't think my review is useful why not enlighten me as to why??? Simple rewards with no hassle. I was looking for a simple card to add to my wallet. This card is prefect for everyday purchases. I received my 200 dollar sign up bones quickly and I didn't have to ask. Update: When I first applied my app went to pending but I called a few days later and received my card within a week. The application process was easy. I know there are a lot of negative reviews but I have not had any issues.